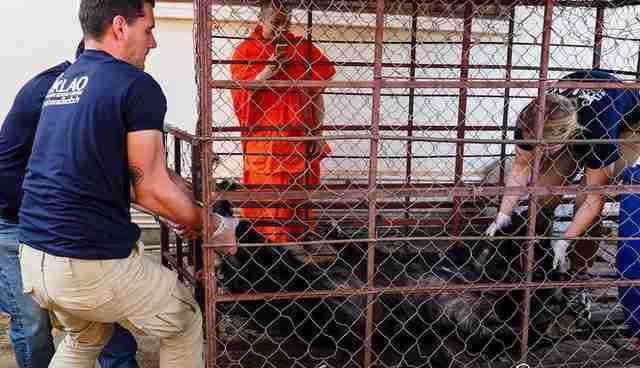 Last week, members of the Laos Wildlife Rescue Center (LWRC) arrived at a Buddhist temple to rescue a bear. They found a heartbreaking scene. 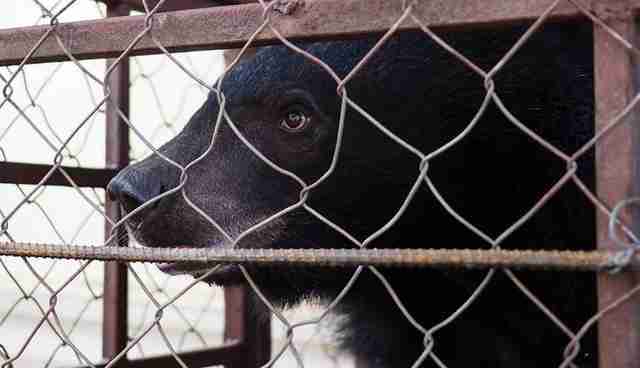 The young Asian black bear, who was later named Joe, had been locked up in a cage that was barely big enough for him to turn around. 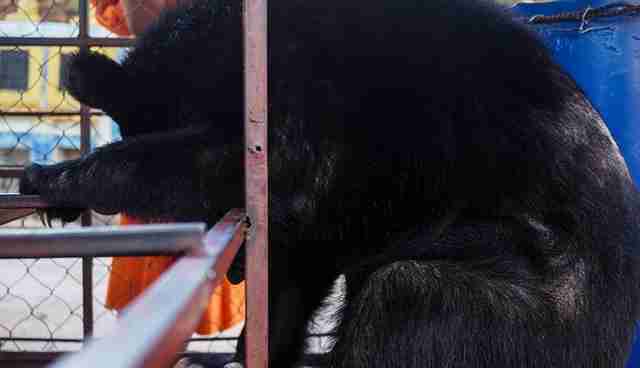 Worse, the bottom of the elevated cage was lined with wire mesh that cut into the young bear's feet, so he spent his days perching on the thin bars that crisscrossed his cage, desperately trying to keep his paws off the painful floor. Left without proper food, he had been surviving off a diet of sweets and soda. 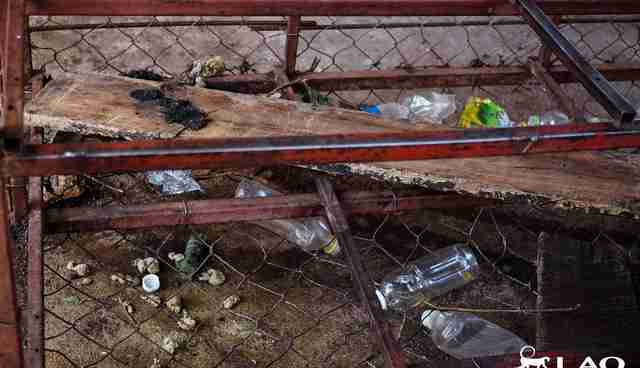 The bottom of his cage was littered with junk food wrappers, juice bottles and other rubbish. He was obese when they found him. He had no enrichment in his wire box aside from the garbage he managed to save from falling through the open floor. "Plastic bottles were the only toys Joe used to have," LWRC wrote in a Facebook post. Though LWRC isn't sure exactly where Joe came from, his story is a familiar one. Like most captive bears, he was likely taken from the wild after his mother was killed by poachers. He was then sold off in one of the many illegal wildlife markets that pepper Laos and other Asian countries where the wildlife trade runs rampant, before his owner turned him over to the temple. 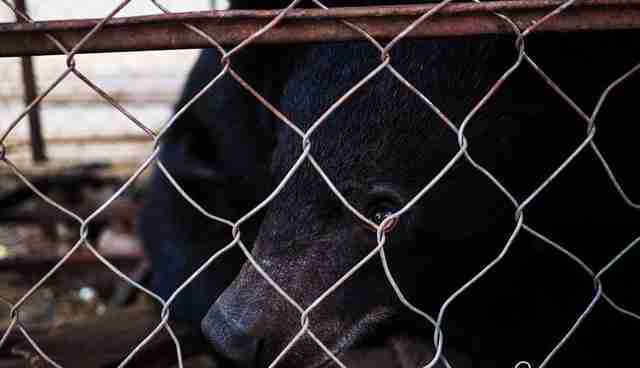 "The trade in bears or bear parts for traditional medicine, cuisine or pets is widely spread in Asia," LWRC said. "People purchasing bear cubs as pets usually quickly realize these wild animals are not meant to be kept at home, resulting them to be sold on or instead they are being kept and hidden away in horrendous circumstances." While Joe was one of the lucky ones to escape, his story sheds light on the fate of many wildlife trade victims, and in particular the growing number of animals being neglected and even abused at temples. Many of the temple animals are former pets who were abandoned there when their owners realized they were unprepared to care for them. The temples, though sometimes well-meaning, are equally unprepared to care for the animals, and often leave them to suffer in tiny cages with poor diets and no proper care. The worst temples actively encourage people to turn over animals, creating cruel menageries to attract visitors and their money. And government officials are often reluctant to intervene because of the privilege accorded the monks. 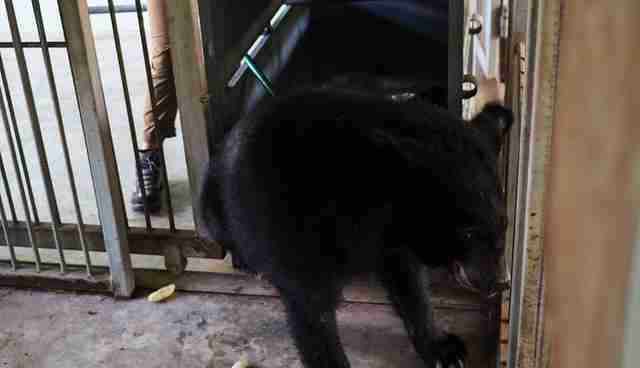 Last year, Wildlife Friends Foundation Thailand (WFFT), LWRC's sister group, rescued a bear from a Buddhist temple who had been locked in a sunless room for three years and was so malnourished and hairless she was virtually unrecognizable. She died shortly after. 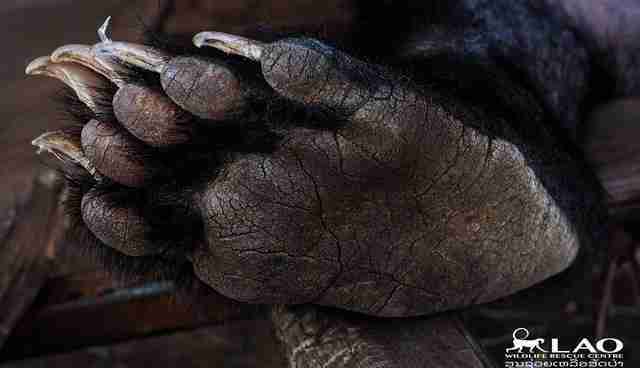 "The commercial trade in bears unfortunately puts a price on every wild bear's head," LWRC said. Fortunately for Joe, his story was one of the happier ones. Someone who saw his plight tipped off the Laos forestry department, which decided to intervene with the help of LWRC. The monks agreed to sign him over, and the rescuers relocated him to LWRC's sanctuary, where he'll spend a few weeks in quarantine then move on to a freer and healthier life - and maybe even gain a friend. 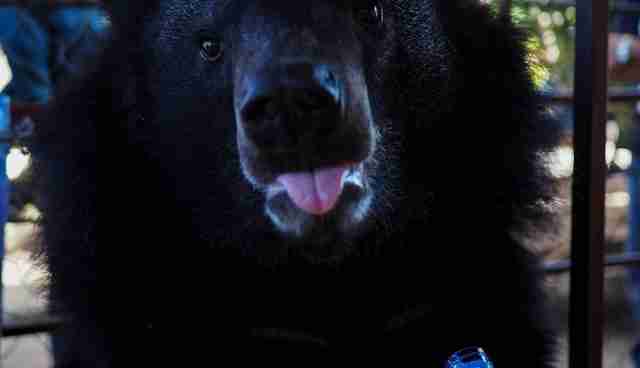 "He will be moved outside to our new bear fields and hopefully will be matched with our other recent rescue Teddy!" LWRC wrote. If you'd like to help care for Joe and other rescued animals like him, you can make a donation to WFFT.